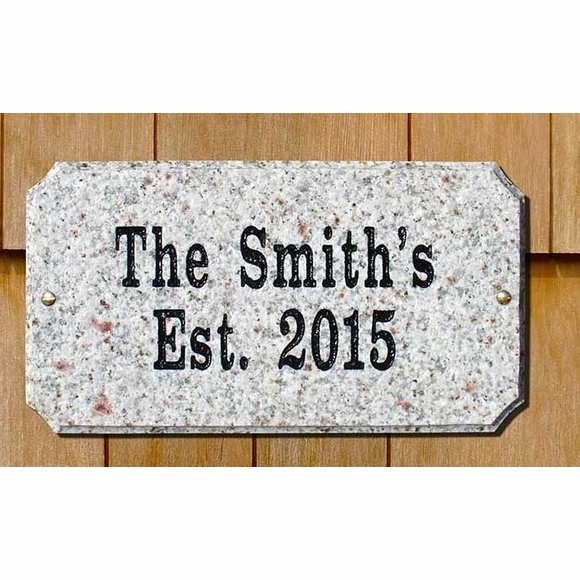 Personalized Solid Granite Family Name House Plaque - - closing gift plaque. Made of solid granite with a natural stone texture. A perfect way for Realtors to congratulate a client on the purchase of a new home. Personalized with the shape, granite color, letter color, and font style you select. Rectangle sign is also available with a decorative scroll frame (see small image above). Personalized with one or two lines of deeply engraved numbers or text. Using Line 2 for the Est. year as shown in the rectangle and oval signs adds a distinctive touch. Or use Line 1 for the house number and Line 2 for the family name as shown in the arch. Styles: oval, rectangle, rectangle with scroll frame, arch. Granite colors: black (arch), autumn leaf (shown in rectangle), quartzite (shown in oval). Letter colors: black and gold. Fonts: clarendon and times roman italic. Attention Realtors: make an excellent closing gift. It's a classy way to conclude any real estate closing. And it's a great way to remind clients of your professional service.